Could Sierra Wireless Be a Millionaire-Maker Stock? Lots of new devices are getting hooked up to the internet. According to tech research group IDC, global spending on the Internet of Things -- the movement to hook up all sorts of devices to the internet and connected networks -- will reach $745 billion in 2019. That's a 15% increase over 2018, and research forecasts double-digit expansion through 2022, at which point global spending would exceed the $1 trillion mark. That's a huge opportunity that has caught the attention of many investors. Enter Sierra Wireless (NASDAQ:SWIR), a semiconductor and service company focused exclusively on the IoT. The pure-play stock on device connectivity could be part of a strategy to ride the IoT to big investment gains. Check out the latest Sierra Wireless earnings call transcript. The rise of the IoT has helped Sierra consistently increase sales the last few years, and the company has been notching new all-time high revenues of late. Management has forecasted that trend to continue for the immediate future. Overall, that has resulted in the stock more than doubling in value over the last decade. However, bottom-line profits have been more inconsistent, which has kept Wall Street unwilling to push the stock higher. 2018 to-date results are indicative of that fact: great sales momentum but lower overall profits offsetting any optimism on the company. Data source: Sierra Wireless. YOY = year over year. The good news is that Sierra is on a path to move to a more consistent and profitable business model. CEO Kent Thexton said on the third-quarter earnings call that the company sells 17 million devices a year -- still a small fraction of the global market share -- and while device sales should continue to increase, adding recurring service revenue is also a priority. The company's service sales have more than doubled since 2017, which is a welcome addition as gross profit margins on that business segment were 52% through the first three quarters of 2018, compared to a gross margin of 31% for devices. Product sales are on the rise, but they are nevertheless a variable source of income, so as the IoT gets bigger over time, it could provide more higher-profit service business for Sierra. That alone could be a good reason to buy into the company for the long term. In spite of Wall Street's underwhelming support of Sierra's sales advance, now could be a good time to buy in. Though the stock has been inconsistent at best for the last few years, shares look like a good value after the most recent pullback. Price to trailing-12-month free cash flow (money left over after operations and capital expenditures are paid for) is currently at 25.9. However, 12-month forward price to earnings is just 11.7, implying that profits will rebound in a big way in the year ahead. 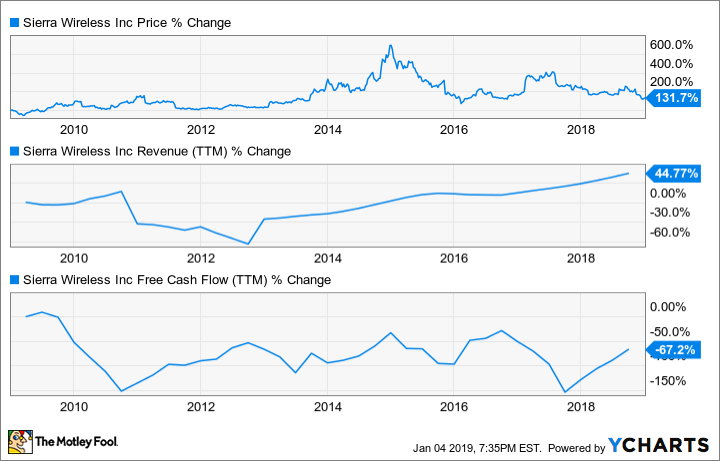 Along with other IoT names like Skyworks Solutions and Cypress Semiconductor, Sierra Wireless' stock looks like a solid way to bet on the expanding importance of the internet and connected networks of devices. Considering the drop in share prices (especially during the last couple of months), now could be a great time to consider a purchase, one that could lead to big profits as the IoT continues to build momentum.